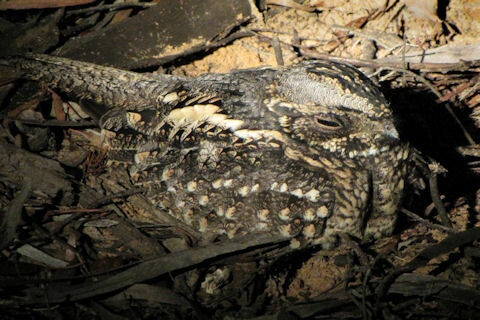 A midnight scout of mallee bushland in Victoria's north-west located this Spotted Nightjar by its eye-shine. It was nestled on the ground beneath a bush amongst the leaf litter. Without the eye-shine the bird was perfectly camouflaged and virtually invisible. We were able to approach to within a couple of metres without it flushing and to get great views as these photographs show.